It’s always good to pay attention and notice things around you. You never know when something random might make a difference. It’s been a rough week: I’ve had a bunch of projects to work on, personal issues to deal with, and yesterday I was feeling pretty low and stressed out. Topping it all off, I pulled a muscle in my calf while running last week and have been trying, largely unsuccessfully, to heal it so I can return to my newfound love of beating the crap out of myself running the three-mile loop around Town Lake. For the past several days, as I’ve walked to and from my garage at work, I’ve passed an unassuming “weed” growing in an unattended patch of ground next to a parking lot. 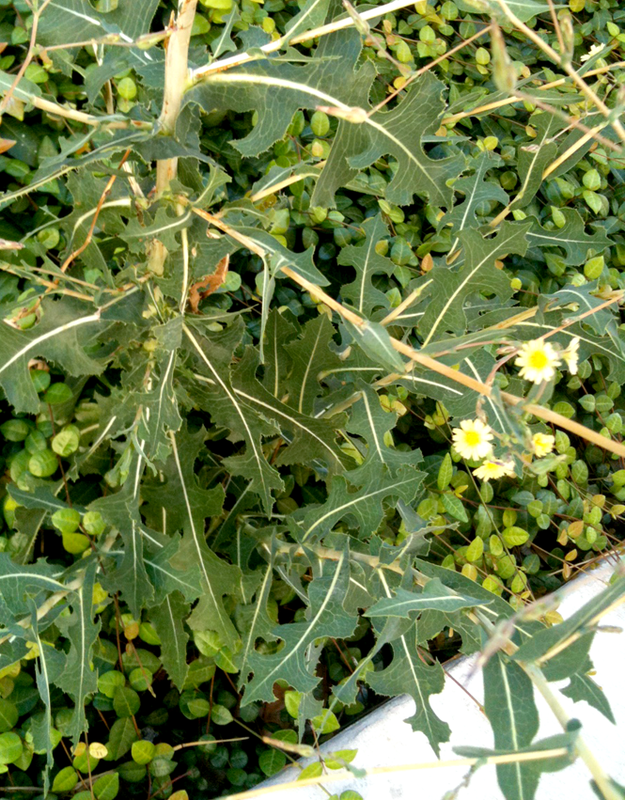 Although I’ve just jumped into the middle of the Herbology Level 1 class taught by Sam Coffman of The Human Path, the plant struck me as possibly being Wild Lettuce (Lactuca virosa), a plant known sometimes as lettuce opium. I snapped a photo (the one I’ve posted here) and sent it to Sam for identification. After he confirmed its identity, I decided to experiment with it. On the way to my car I took a couple stalks from the plant (leaving plenty to flower and reseed) and took them home. I had absolutely no plans for it other than figure it out as I went along. Uncertain as to its ultimate fate, I broke the plant into several pieces and shoved the leaves and stem into a quart mason jar with some hot water, and let it sit for a few hours. Then before bed I reviewed my notes from class. Among other things, Wild Lettuce used to be used as a pain reliever and calming sedative, and the latex/sap was used for warts, suggesting anti-fungal qualities. I wasn’t familar enough with it to use it internally, but I went with my hunch that if I used it externally, enough of the components might be absorbed through the skin to help me feel better. At any rate, into the blender it went, along with some dried comfrey and some chaparral tincture that I just happened to have on hand (comfrey is well-known to help bruises and other injuries, and chaparral is supposed to be great for tissue repair). I figured something was happening because when I added the chaparral tincture (just the single herb in alcohol) the mixture immediately turned cloudy. Something was reacting with something. (That’s the scientist in me!). That meant it was a real experiment! 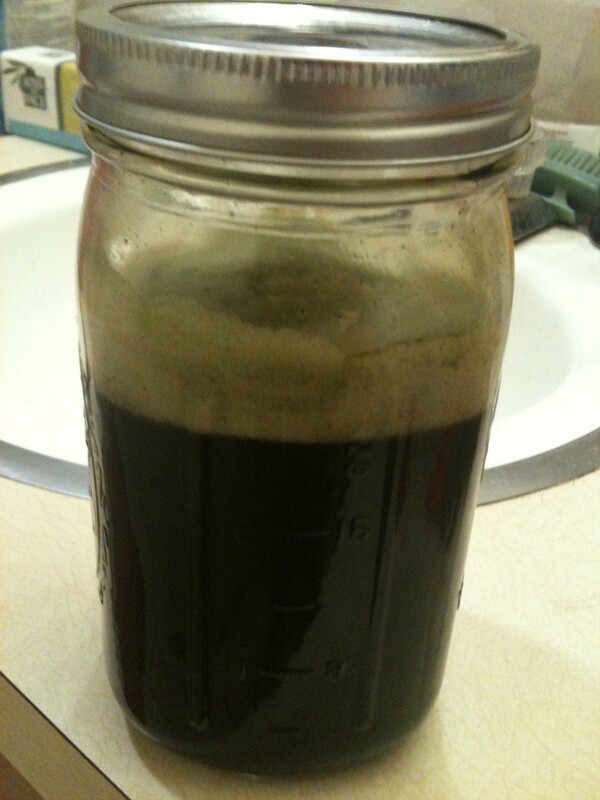 Next, I took my jar of green sludge with me as I filled the bathtub. Along with my wild lettuce soup I added some epsom salts to the water, and then soaked in the tub for a while to see what happened. When I woke up this morning, having slept rather soundly all night, the tightness and soreness in my calf was noticeably diminished. And in an unexpected bonus, my itchy patches of athlete’s foot (that I’ve been treating with tea tree oil with limited results) are completely and utterly silent. I’m not sure what did the trick – was it the chaparral, the wild lettuce, the comfrey, the epsom salts… or some magic that happened when all of these things were combined? Who knows. All I know is that it worked! So thanks, wild lettuce, for appearing when I needed you. And to everyone else: think twice before you dismiss that plant as a weed!